We are glad to announce that the book Lung Cancer is accomplished and launched recently by the AME Publishing Company (Figure 1). At the 3rd Asian Single Port VATS Symposium & Live Surgery held on March 26-27 in Hong Kong, an announcement ceremony for the book on Lung Cancer was held (Figure 2). In its debut, we are glad to see the book well received by the international experts. Figure 2. 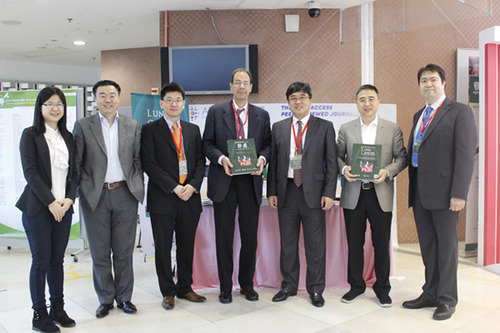 The book on Lung Cancer was launched in the 3rd Asian Single Port VATS Symposium & Live Surgery with the recognition of the world known experts (from right to left): Prof. Alan Sihoe, Prof. Jianxing He, Prof. Jheon Sanghoon, Prof. Thomas D’Amico, Prof. Calvin Ng, Prof. Keneng Chen. Our Honorary Editors-in Chief for Lung Cancer are Prof. Jie He and Prof. Rafael Rosell and the Editors-in Chief are Prof. Jianxing He, Prof. Thomas A. D’Amico and Prof. Xiuyi Zhi. The Associate Editors-in Chief include Prof. Qun Wang, Prof. Tristan D. Yan, Prof. Calvin Ng, Prof. Caicun Zhou, Prof. Heather A. Wakelee, Dr. Wenhua Liang. Despite many years of dedicated effort, including basic, translational and clinical research, public education, and health care policy, lung cancer remains the number one cause of death by malignancy in the world, and it is responsible for as many deaths as colon, breast, pancreas and prostate cancers combined in the US. Thus, successful efforts to better understand and better treat lung cancer will have long lasting ramifications, for patient care specifically and for public health globally, as well. The volume, Lung Cancer, is just such an effort. 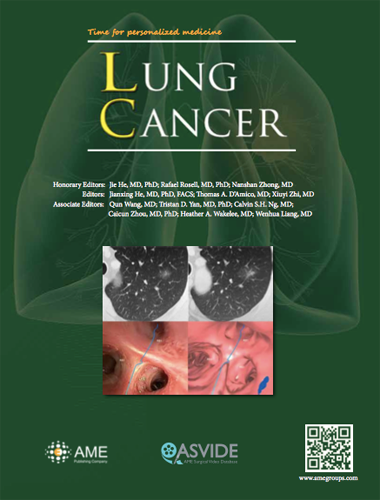 Comprised of contributions by the most accomplished scientists and clinicians internationally, Lung Cancer thoroughly examines the spectrum of topics related to better understanding and better treating the world’s most lethal malignancy. From the basic science of lung cancer to the most advanced therapeutic techniques, this text provides the reader—student or professional—with a most comprehensive analysis. Lung Cancer also provides practical information epitomizing the rapid progress in the field of lung cancer today and instilling in physicians the confidence derived from this knowledge when dealing with patients. We would like to express our gratitude to all the leading investigators who have contributed to this endeavor and to the growing knowledge of lung cancer today. The book Lung Cancer is now available both online and in print with English and Chinese version. Please enjoy. 227 Thoracoscopic sleeve resection—the better approach? 246 Management of ground-glass opacities: should all pulmonarylesions with ground-glass opacity be surgically resected? 513 Are we ready to use biomarkers for staging, prognosis and treatment selection in early-stage non-small-cell lung cancer? 632 Inhibition of insulin-like growth factor receptor: end of atargeted therapy?